Tournaments – Casino 99 Chico | Casino 99 is Chico, California’s local casino that provides the highest levels of customer service with a wide variety of Poker and Blackjack games and tournaments whether you’re a novice or a seasoned pro, we invite you for a game of Poker with food and drinks from our Bar and Grill. You’ll find poker tournaments where players of all skill levels will feel comfortable. Our staff remains committed to providing the highest levels of customer service, whether it’s keeping you supplied with fresh food and drinks, or keeping you informed about the action. Tournaments at Casino 99 can be a fun, one-night experience. But we also track points to determine the Player of the Year, who could win thousands of dollars in prizes at the end of the year. On this page, you can find the standings of each of our top players, as well as a schedule of upcoming games. 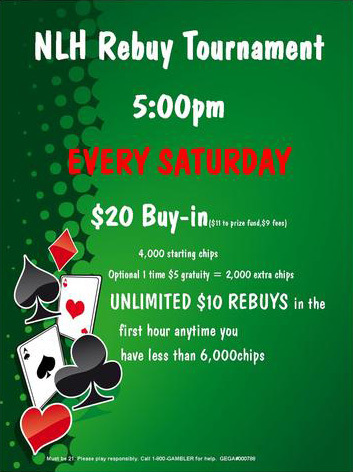 Thursdays at 6 pm NLH Tournament $57 buy in. Player of the Month (P.O.M.) Tournament is the second Sunday of each month.